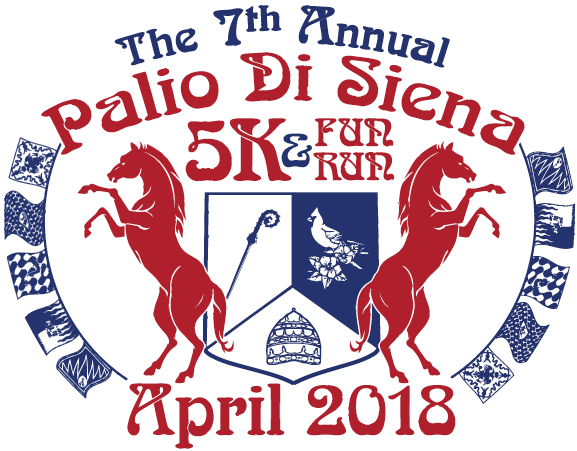 Mark your calendars for the 7th Annual Palio di Siena 5K, Fun Run and Raffle! Awards to the top 2 male and female finishers in the following age groups: 9 & under, 10-14, 15-19, 20-29, 30-39, 40-49, 50-59, 60 & over. Packet Pickup and Late Registration: You can pick up your packets race morning, from 7:30 to 8:30 am. Join us on Friday, April 27, from 6:30-8:30 pm at St. Catherine of Siena Church (1020 Springvale Rd, Great Falls) for our pre-race pasta dinner starting at 6:30 pm! The race is stroller friendly! 8:45 am -- Head to the Starting Line! 9:00 am -- 5K Start! 9:50 am -- Half Mile Fun Run/Walk Start! Please consider competing as a "contrade" by forming a team. You will be assigned a mascot and flag of one of the naighborhoods in Siena, Italy that competes in the annual horse races. A team consists of a minimum of 7 runners including at least one female. The top 5 times (including at least 1 female time) will be combined to determine the winner. The prize money must be donated to a Catholic organization (a school, parish, CCD program, youth organization, pro-life group, etc). Teams must notify Siena Academy of who they will donate the prize money to by emailing office@sienamontessori.org. All organizations must be pre-approved by Siena Academy prior to race day. The check will be made out directly to the organization. Choose an existing team name from the drop down box when registering, or add a new team name in the space below the drop down box.